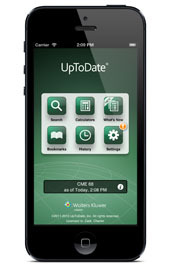 Did you know - 94% of subscribers say UpToDate improves quality of care. Enhance shared decision-making with nearly 1,500 patient education topics, which you can review with patients, print as handouts, or send via email. Understand the evidence behind the recommendation to best treat your individual patient. Jump to the recommendations section of each topic with just one click to save time. ACT NOW! Rejoin the more than 1 million UpToDate users worldwide who rely on UpToDate to keep them current with developments in their fields and 21 others as well.